Renowned for his reputation as one of the most important landscape painters in nineteenth-century American art, Asher B. Durand is best known as the leader of the Hudson River School and co-founder of the National Academy of Design. Born in 1796 in Jefferson Village, NJ, Asher Brown Durand was the eighth child of Rachel and John Durand. Throughout his childhood, Durand worked closely with his father, a watchmaker and silversmith, before beginning an apprenticeship under the engraver Peter Maverick in Newark, NJ in 1812. After only five years, he advanced within the ranks and became Maverick’s co-partner, founding a branch of the business in New York City. Though the partnership dissolved in 1820, he would soon form his own lucrative banknote, commercial engraving, and printing company with his brother Cyrus. Durand quickly gained national recognition as an engraver and made profound contributions to the iconography of the paper money then in distribution, using classical motifs and contemporary references of political and military heroes that remain an integral part of our national currency. In 1823 he completed an important commission by John Trumbull to engrave the Declaration of Independence, a project that earned him fame and substantiated his position in the art world. At the apogee of a commercially successful career as an engraver, Durand’s interests shifted to painting. Largely self-taught, he studied oil portraits and prints, attended the anatomical lectures of Dr. Wright Post, and drew from casts of classical sculpture at the American Academy of Fine Arts. His early works of the 1820s and 1830s reveal his precise rendering and superior draftsmanship. In 1837 Durand accompanied his friend, the artist Thomas Cole, on a sketching trip in what would be Durand’s first visit to the Adirondack Mountains in New York. Durand was moved by the quietude and splendor of the American wilderness and felt an instant kinship with the land. This excursion, coupled with a financial panic that year that limited patronage for portraiture, prompted Durand to turn to landscapes for the duration of his career. Durand’s views corresponded with the sentiments of his countrymen, who favored a sense of nostalgia that yearned for the uncorrupted, undomesticated nature of the distant past, and a national effort to tie America’s cultural identity to the magnificence of its land. Durand returned to America with a renewed fervor, as he wrote to Cole, and a personal agenda to paint “the beauties of my own beloved country. Durand painted in a realistic style that embodied the main tenets of the Hudson River school: a commitment to naturalism, a keen attention to detail, and above all, a deep love of nature—what Daniel Huntington later called a “passion, an enthusiasm always burning within him.” Within a prolific oeuvre spanning from the 1830s onward, Durand explored a variety of themes: marine, wilderness, forest, and pastoral landscapes formed his artistic repertoire. Durand was celebrated for the botanical precision of his foliage, the minute details that captured every mossy-covered rock, branch, and leaf with an arresting topographical accuracy. He also forged unique compositional elements: his panoramic, sweeping views and vertical formats are immediately recognizable, signature components of his works. Though Thomas Cole arguably had the greatest influence on Durand’s stylistic development, their art also revealed fundamental differences as reflected in the dual approach adopted by the next generation of Hudson River school artists. Like Cole, Durand depicted both the sublime grandeur of the American wilderness and evoked the pastoral relationship between man and nature. Yet his first landscapes, redolent of many of Claude Lorraine’s thematic and stylistic tendencies, were serene and bucolic in contrast to Cole’s often wild, romantic, and theatrical conceptualization of nature. As Durand developed his own mature style, he championed naturalism, placing greater emphasis on the real versus the ideal and capturing the specificity of nature in his works. Of all the Hudson River School painters, Durand was the most avid proponent of working en plein air, or directly from nature, a progressive departure for artists of the period, who traditionally created sketches outdoors and finished large-scale works in their studios. 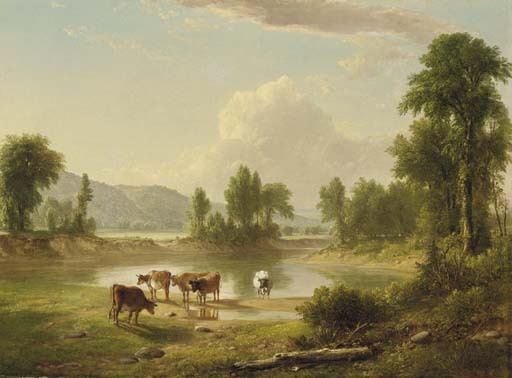 In addition to Durand and Thomas Cole, the first generation of Hudson River School painters included John W. Casilear, John F. Kensett, David Johnson, Jervis McEntee, George Inness, Jasper F. Cropsey, Homer Dodge Martin and Alexander Wyant. Following the death of Cole in 1848, Durand was considered the leader of the Hudson River School, which reached its peak by the 1850s. Durand’s art set an important precedent for the nation’s fledgling sense of self, painting landscapes as a direct expression of cultural nationalism. Durand was at the forefront of this crucial development. The venerable tradition of landscape painting, which has its roots in the Hudson River School, continues to inspire American artists today. An active member of the art community, Durand formed friendships with some of the most influential figures of his time, including Samuel Morse, John Vanderlyn, and William Cullen Bryant. He also played an instrumental role in establishing some of America’s most well-known art institutions; he was a founder and member of the Century Association, the New York Drawing Association, the Sketch Club, and the National Academy of Design, serving as President from 1845 to 1861. In this capacity, Durand had a profound impact as a friend, mentor, and teacher to successive generations of American artists. He additionally contributed regularly to art historical literature, relating his theories on art and nature in Letters on Landscape Painting (1855) in the monthly periodical The Crayon. Durand retired from an illustrious career in 1869, spending the remainder of his years on his family farm in New Jersey, where he passed away in 1886. Durand was enormously successful throughout his career, though his fame soared to new heights recently when his painting, Kindred Spirits (1849), secured a record auction price at $35 million when it was purchased by Walmart heiress Alice Walton in 2005. In 2006 the Brooklyn Museum launched a major retrospective of his art, highlighting his critical role in the Hudson River school. Durand’s works may be viewed in such esteemed collections as the Smithsonian American Art Museum, Corcoran Gallery of Art, Museum of Fine Arts, Boston, and The Metropolitan Museum of Art. 1828 A.B. & C. Durand, Wright & Co renamed Durand, Perkins & Co. Wife Lucy became ill.
1835 With Reed’s patronage, ended his career as an engraver. Traveled to Boston, Washington, and Brunswick to paint Presidential portraits for Luman Reed. Visited Washington Allston. Painted Senator Henry Clay for Charles Augustus Davis in Washington and President Andrew Jackson for Luman Reed. Visited Thomas Cole in the Catskills in the fall. 1836 Death of Luman Reed. Traveled to Hudson, Saugerties, Catskills, Albany, Utica, Boston, Trenton Falls, and Madison, in company with John W. Casilear part of the way. 1838 Contributed nine landscapes to N.A.D. annual exhibition. Reopened Amity Street home. Began sketching excursion in the Hudson River Valley in September with Casilear. 1840 Added studio to the house on Amity Street. Jonathan Sturges advanced money for European tour. Beginning June 1st, traveled with John W. Casilear, John F. Kensett, and Thomas P. Rossiter to England, France, Germany, Switzerland, and Italy. The 1849 painting "Kindred Spirits," by Asher B. Durand, has a new owner. Alice L. Walton, the Wal-Mart heiress and one of the richest people in the world, bought the Asher B. Durand painting yesterday from the New York Public Library for what is said to be more than $35 million. She plans to exhibit it in a museum being built by her family's foundation that is scheduled to open in May 2009 in Bentonville, Ark., where her father, Sam Walton, opened his first retail store in 1951. Sotheby's acted as the library's agent for the sale, holding a silent auction for which interested parties were asked to submit sealed bids. 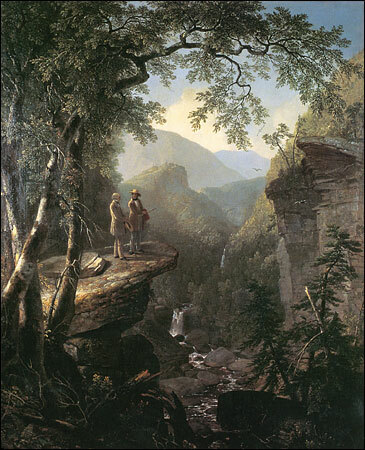 The painting, which depicts the painter Thomas Cole and the poet William Cullen Bryant standing on a rocky ledge overlooking the Catskills, is titled after a phrase in a Keats sonnet and has long been considered one of the finest examples of Hudson River School painting. It was commissioned by Jonathan Sturges, one of Durand's most important patrons, as a gift for Bryant, and it remained in the Bryant family until his daughter, Julia, donated it to the New York Public Library early in the 20th century.